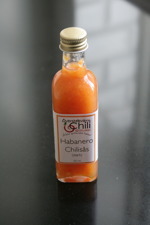 Habanero Sauce – Fruity and hot, this is the hottest sauce in the standard range. The sauce contains a blend of 3-4 habanero chillies (depending on the harvest) mixed with a milder chilli, the Santa fe Grande. 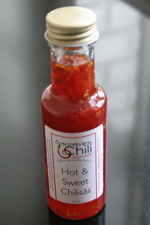 This combination of chilli reduces the heat just enough to lift out the sweet fruity characteristics of the Habanero. Chilli & Rhubarb – A good accompaniment to most food, the Chilli and Rhubarb Chutney goes particularly well with cheese, cold meats or on a buffet - but why not give it try with Sunday lunch or with vanilla ice cream! 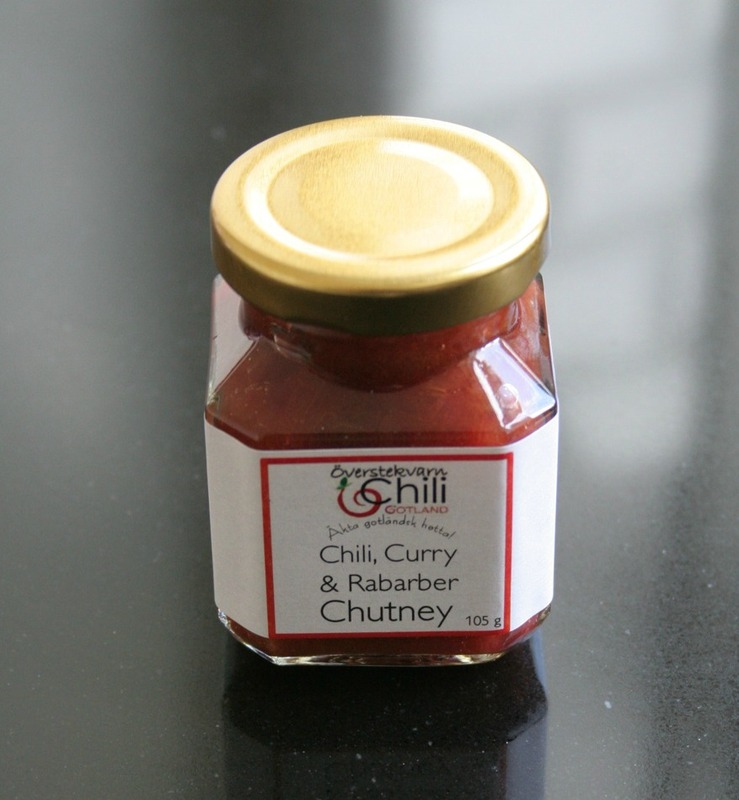 This Chutney won us a silver medal in the ’SM i Mathantverk 2015’ competition. 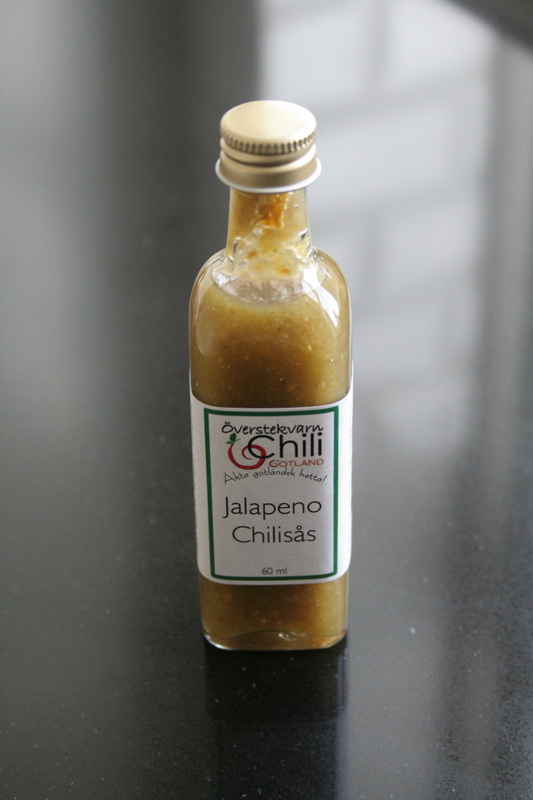 Jalapeno Sauce – Fresh and a milder sauce, this goes particularly well with tacos, hamburgers, pizza, fried egg… Almost anything and everything! The Jalapeno chilli has a strong, and popular, character. 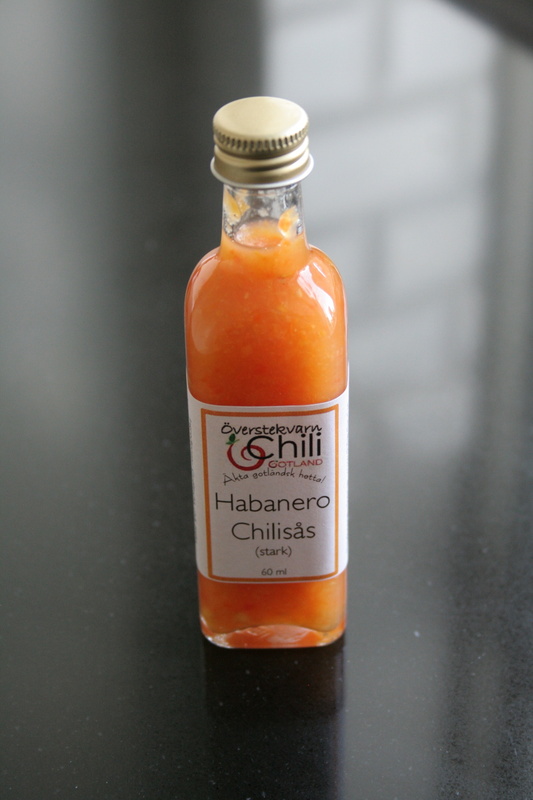 This sauce has a fresh and slightly sour flavour, and a clearly recognisable Jalapeno taste. Chilli & Plum – This is a must have for a cheese platter, or on the breakfast table! It is particularly good with soft cheeses, for example Brie and Camembert, it works well with blue cheese (think Roquefort or St. Agur) and will complement a variety of hard cheeses such as Cheddar or Gruyere. 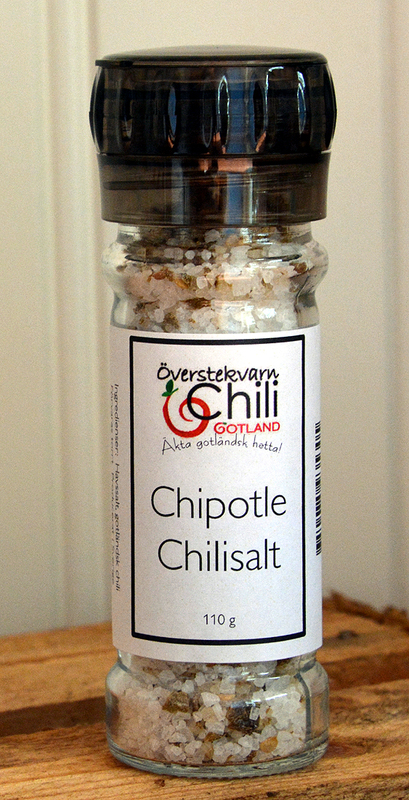 We have also successfully used this as a marinade to pork fillet. 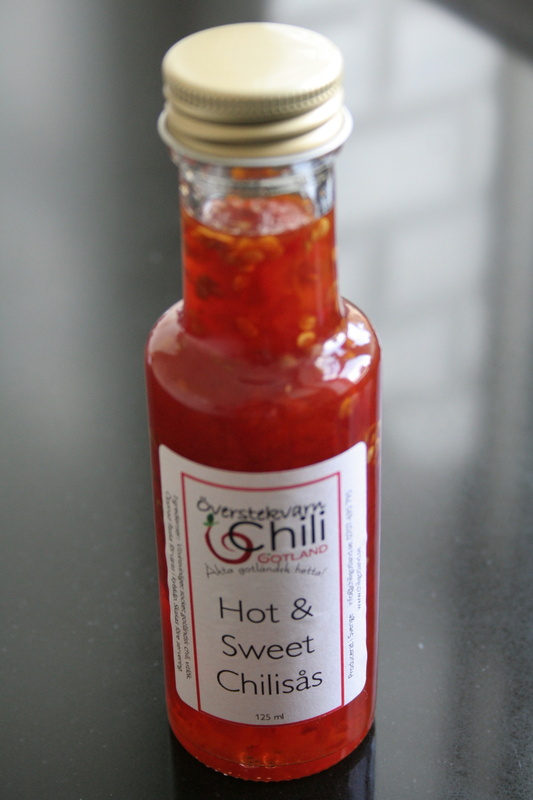 Hot & Sweet Sauce – A sweet sauce with a decent amount of heat that comes from a blend of our chillies. 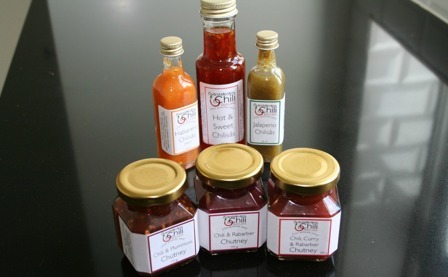 This sauce has no thickening agents, preservatives or any of the other junk that you’ll find makes up the main ingredients in regular shop bought sweet chilli sauces. Its ingredients (in order of quantity) are: chilli, sugar, vinegar and garlic – that’s it. It’s simple, it’s clean and tastes great, and it won’t make you grow 2 heads! Chili, Curry & Rabarber – A good accompaniment to most meat dishes, the Chili, Curry and Rhubarb Chutney is the most used chutney on the farm. 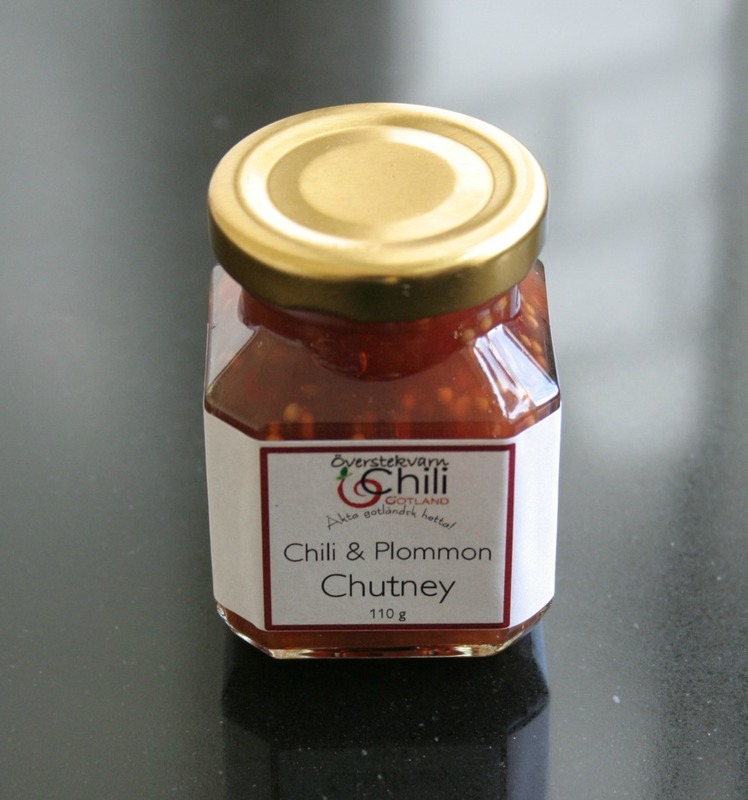 This chutney goes particularly well with lamb, chicken, pork, hamburgers and hotdogs, and just about anything that you might BBQ - but try it with some roasted peppers or some haloumi, we don't think you'll be disappointed. Chilli Pepper Relish – An exciting new flavour with red pepper as and chilli as the stars of the show. 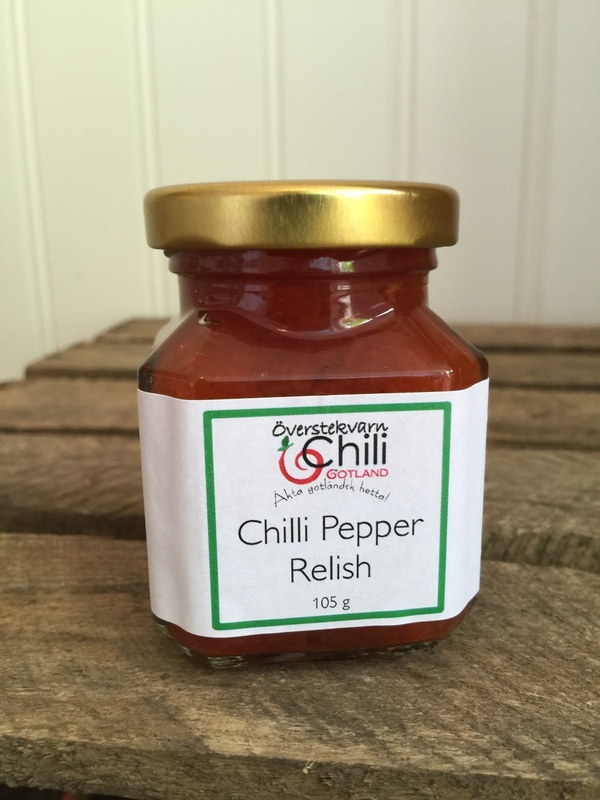 It can be used as an accompaniment to most meals, here we use it as a replacement for tomato ketchup and as an ingredient to other dishes. If you aren’t familiar with this product it could be described as a chunky savour jam. 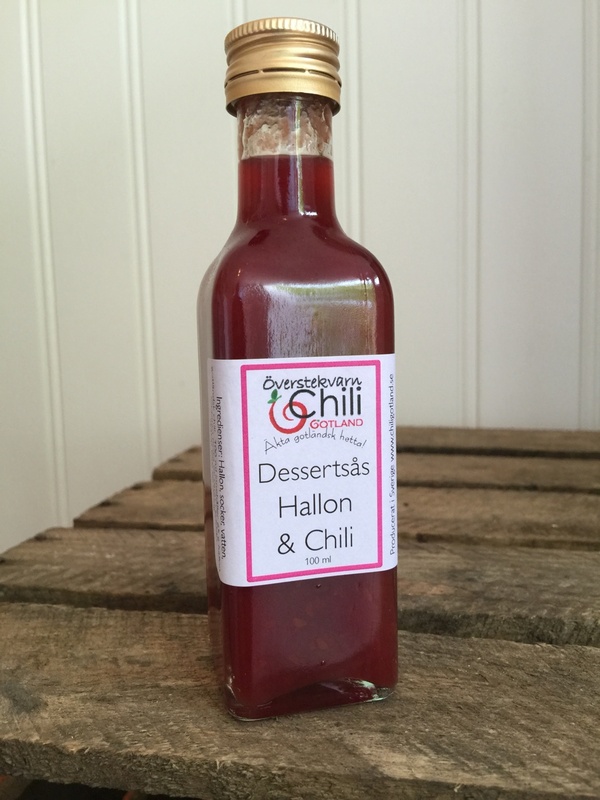 Raspberry & Chilli Dessert Sauce – Uses for this exciting dessert sauce is limited only by your imagination. 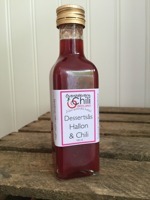 It was developed as a fresh ice cream topping, but has since been enjoyed in or on a variety of cakes, with panna cotta, on pancakes and waffles, we have even mixed it into our midsummer cocktails. 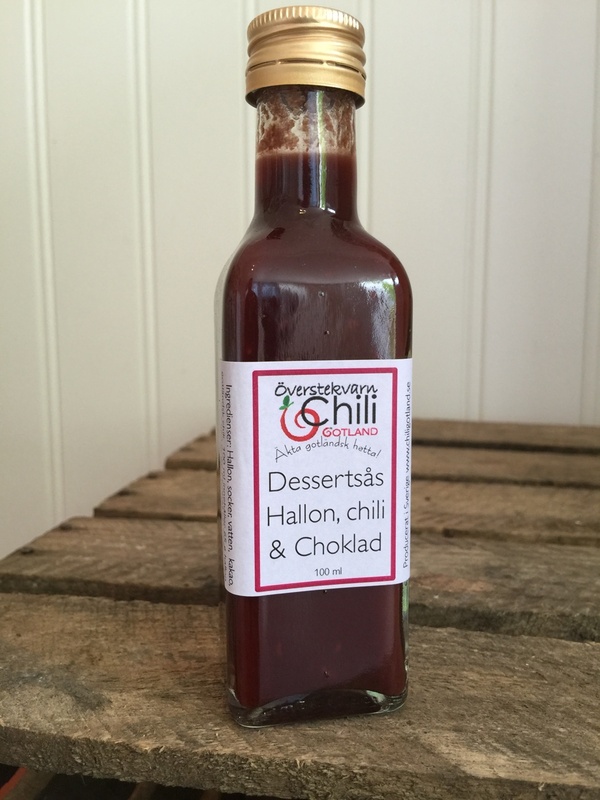 Raspberry, Chocolate & Chilli Dessert Sauce – This is the richer flavoured twin to the Raspberry & Chilli Dessert Sauce. The addition of chocolate gives it a thicker more luxurious texture, where the chilli kick is a little more delayed. Give your ice cream a hot aftertaste. It’s also a great way to stop the kids from eating all the ice cream! 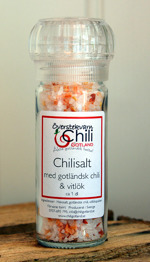 Chilli Salt flavoured with Garlic – Very popular salt that can be used in all sorts of meals. The chilli and salt are dried together to produce an attractive pink hue, that it backed up with just the right amount of heat and a seasoning of garlic. 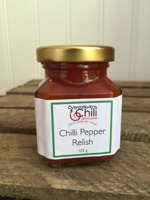 From fried eggs for breakfast through to a cheese supper, this is a very popular product. 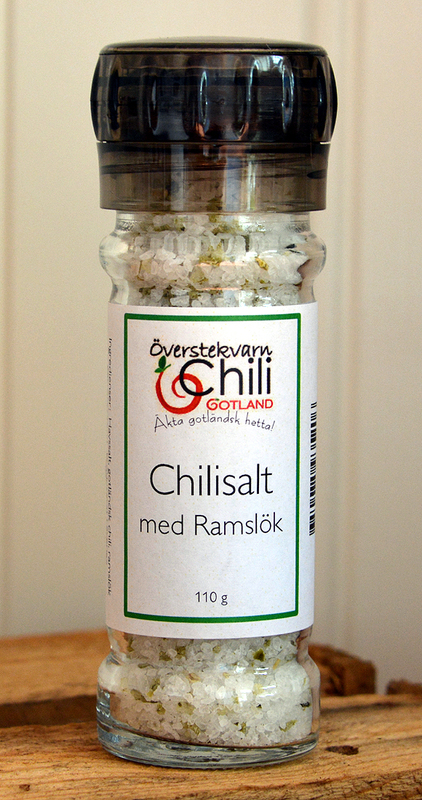 Chilli Salt flavoured with Wild Garlic - Wild Garlic, known as Ramslök, in Sweden, grows on Gotland in the spring time. Its flavour is different to traditional garlic, subtler it could be characterized as tasting like mixture of garlic, chives and onion. 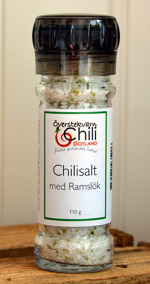 The leaves of the plant are dried, along with Jalapeno chillies and sea salt, which gives the it a green colour. 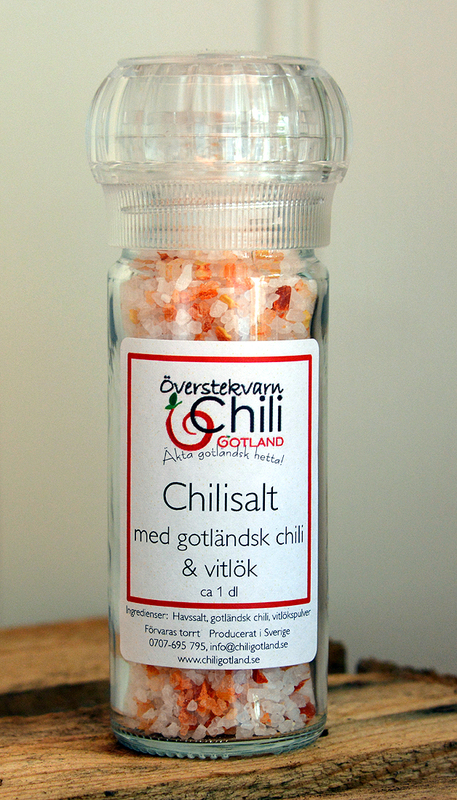 This salt is milder in heat and flavour than our Chilli and Garlic salt, and works well on salads, cheese and dishes that will benefit from a fresh salty taste. Chipotle Chilli Salt – A traditional Chipotle is a smoked Jalapeno. These we smoke here on the farm. Once the chillies have been smoked for approximately 18 hours, they are mixed with sea salt and continue to dry for another 24-36 hours. The result is a rich smoky aroma that can enhance any food that is grilled, or will be improved with a smoky taste.